Turn up the volume and watch out because Stevie Stone’s first official single from Rollin’ Stone has arrived and it’s a banger! 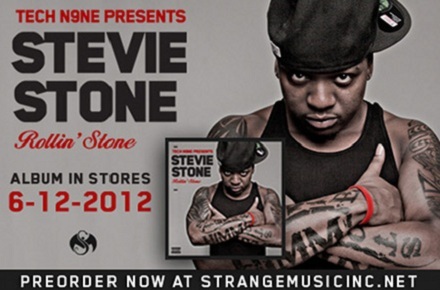 In anticipation of Stevie Stone’s Strange Music debut, XXLMag.com world premiered the heavy-hitting “808 Bendin” featuring Tech N9ne. Just as the name implies, “808 Bendin” features some potent 808 drum production with Stevie Stone and Tech N9ne ripping through two rugged verses. The brand new track lives up to Stevie Stone’s reputation for dropping monstrous hits and is a prime cut from what is sure to be one of the summer’s hottest releases. Fans on the web are rallying behind Stevie Stone as “808 Bendin” destroys speakers everywhere. “808 Bendin” may just be the banger to end all bangers. Check out what fans on the web are saying about “808 Bendin”! What did you think of “808 Bendin”?